Your laundry room is the cleaning headquarters, so it’s no surprise that it starts to get filthy over time. As dirty clothes, sports jerseys and cleaning rags arrive for their makeover, they leave a lot of filth behind. Molly Maid hasn’t forgotten that your laundry room needs a deep clean too. Learn more about our laundry room cleaning services, and get a few great tips from our cleaning experts. The paradox of the laundry room is that the room meant for washing linens rarely gets the cleaning attention it deserves. It’s our mission to stop the neglect! Because washing clothes in a dirty and dusty laundry room is like washing a floor with a dirty mop. The laundry room is included as part of our house cleaning service. How do we clean your laundry room? Dust window sills and shelves. Wipe out and rinse the utility sink. Sanitize and wipe down all surfaces, including your washer and dryer. Keeping your laundry room clean and organized makes staying on top of the seemingly endless pile of dirty clothes less stressful. Use these laundry room cleaning tips to streamline your laundry room duties! If you have a high-efficiency (HE) machine, only use HE detergent to reduce soap-scum buildup. Eyeballing the detergent is quick and easy, but it’s also a waste. Use a measuring cup to avoid waste and excessive suds. After all, excessive suds often lead to excessive residue. If you have a front-loading machine, keep the door cracked after a load to allow the wash drum to dry out. Use different hampers for whites, colors and delicates to avoid laundry mishaps and speed up the folding. Keep a dedicated trash bin for dryer lint as a reminder to always empty it before each load. Body oil on your shirt collar? Grab a paintbrush and some shampoo. Believe it or not, newspaper makes a great iron cleaner. Where do you think all that dirt, bacteria and grime go? If you shrank a sweater made of natural materials, you may be able to stretch it back to size! A clogged lint trap isn’t just bad for your dryer; it’s also a fire hazard. While we can help keep your laundry room clean, our ultimate Stain Removal Guide will help keep your laundry clean. The guide includes step-by-step instructions for handling all types of stains. 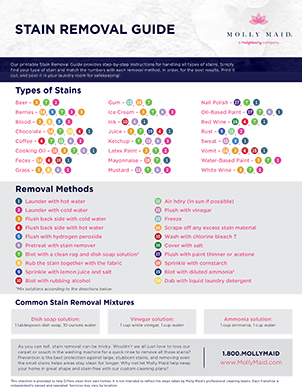 Simply find your type of stain, match the numbers with each removal method and follow the steps in order for the best results. Print it out, and post it in your laundry room for safekeeping! These are just some of the tips we have for keeping a laundry room clean. With more than 30 years of cleaning experience, we know the most effective way to keep a laundry room clean is to clean it on a weekly basis. Let’s not pretend everyone has all the time in the world to clean their home. We get it – your time is valuable! Let us keep your house clean so you have more free time to spend doing the things you love. Our professional cleaning services will take care of all the dusting, mopping, vacuuming and more. Give us a call at (800) 654-9647to discuss a cleaning plan that’s just right for your household. You can also Request a FREE Estimate online.